Green Day will release the 2017 documentary, “Turn It Around: The Story Of East Bay Punk”, and its companion soundtrack on June 22. 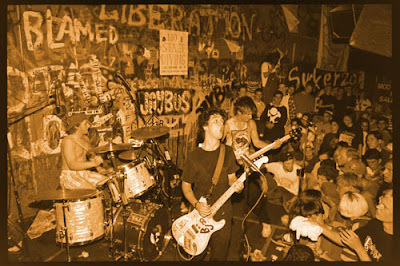 Directed by Corbett Redford, narrated by Iggy Pop and executive produced by Green Day, the film spans more than 30 years of the California Bay Area’s punk music history at the music collective 924 Gilman Street in Berkeley, CA, where they got their start in the 1980s.at a club that helped launch the careers of The Offspring, Rancid, and Operation Ivy, among others. The project made its world premiere as the opening night film of 2017's 16th San Francisco DocFest, followed by an initial two-week sold-out theatrical run at the Alamo Drafthouse Cinema in San Francisco, CA. The hometown opening was followed by many sold-out screenings in over 100 theaters in cities across USA and Canada in tandem with Green Day's Revolution Radio World Tour, with the theatrical campaign launching with a three-week run at IFC Center in New York City and culminating in Los Angeles for one night only on three sold-out screens at the ArcLight Hollywood. The 2-disc Blu-ray and DVD combo packs feature the full-length theatrical cut of the film, as well as five deleted scenes and more. Available as a 2LP or double-cassette set, the soundtrack delivers the opening & closing credits songs from the documentary and 35 mostly rare, unreleased and/or out-of-print tracks from bands like Green Day, Rancid, Neurosis, Operation Ivy, Jawbreaker, Pinhead Gunpowder, and many more. Proceeds from the soundtrack go to the Women's Daytime Drop In Center, a non-profit program in Berkeley, CA, empowering women and children to move from the streets to a home by providing ongoing and intensive counseling, case management services, daily support groups, a comprehensive children's program, a variety of referral services, and a transitional housing program for four single parent families. To learn more and/or to support the organization directly, visit womensdropin.org. Formed in 1986 in Berkeley, CA, Green Day achieved breakout success with 1994’s “Dookie”, which has sold over 10 million copies to date in the US alone. The band would go on to release more platinum albums before 2004’s “American Idiot” reconfirmed their place in punk and rock history with 5 hit singles, a pair of Grammy Awards and 6 million copies sold Stateside.